Back in June a comprehensive BlackBerry-related leak told us that the Canadian company would launch three new Android devices from that point on and until Q1 of 2017. In the meantime, two of those have more or less become official already - one is the DTEK50, the other is the (still technically unannounced) DTEK60. Since these handsets' actual specs and release time frames lined up nicely with what was claimed in that rumor, we assume the information about the last of the three BlackBerries was accurate too. If this is the case, then you should expect an Android-running BlackBerry with a physical keyboard to show up at some point in the first quarter of next year. 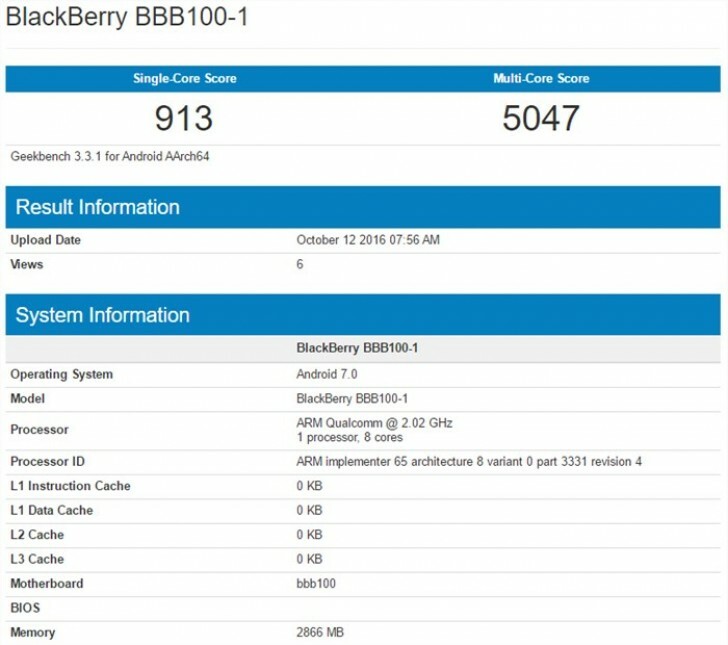 It's apparently codenamed Mercury, and it might be the mysterious BlackBerry device with the model number BBB100-1, which has been spotted in the Geekbench database. This would make sense seeing as how we haven't heard of any other BlackBerry handset currently being in development. The benchmark doesn't reveal a lot of things about the Mercury, just that it has a 2 GHz octa-core processor made by Qualcomm, 3GB of RAM, and it runs Android 7.0 Nougat. The SoC used may be the mid-range Snapdragon 625 based on the CPU core count and clock speed, but this is just speculation. The Mercury has been said to come with a 4.5-inch Full HD touchscreen with 3:2 aspect ratio, a full physical QWERTY keyboard underneath that, 32GB of storage, an 18 MP main camera, an 8 MP selfie shooter, and a 3,400 mAh battery.